SUMMARY: As the adage goes, "A picture is worth a thousand words." For user-generated content, images can hold the power to engage a community. The University of Missouri Alumni Association faced a challenge when the organization moved to a new website — the ability for posting image galleries of the university's events and campus life was difficult and didn't allow for user-generated content. Learn how the association allowed the alumni community to post their own images and better engaged their base to lift site traffic by 15%. In association with the University of Missouri, the Mizzou Alumni Association caters to a member base of 44,000 and serves the entire living alumni base of 295,000. The Mizzou Alumni Association proudly supports the best interests and traditions of Missouri's flagship university and its alumni around the world. "We are acting as a voice of the alumni, looking out for their best interests, supporting all the traditions on campus and serving the university," said David Roloff, Director of Marketing and Strategic Communications, University of Missouri Alumni Association. The Mizzou Alumni Association's main goals are to find ways to connect with alumni and friends of the university through events, services and most recently, interactive media. The university continues to focus on large donors, but as Roloff explained, there is a growing appreciation that every gift matters, large and small. "We're really trying to make those small asks, engage the base, but also let people have a say in where their money goes, and when they don't have a say, at least show them where the money is being spent," he said. In 2009, the Mizzou Alumni Association changed website platforms, and with this change came a challenge with the site's image galleries. Image galleries filled with activities on campus and other Mizzou-related content has been key for the alumni association to stay connected with its base. Over recent years, the association has seen that the community connects with them via the Internet — they don’t like to receive mail and prefer not to be called via phone, especially when the alumni association is seeking donations. "Finding more and more ways that we can sort of connect with alumni and friends of the university electronically, especially through the Internet, has been very important to us," Roloff said. Photo galleries are a key tactic to keep visitors to the alumni association's website engaged with fresh new content of recent events with a main goal of increasing membership and donations. "We've been looking for more and more creative, fun ways to engage people," he added. Roloff and the team felt the photo gallery provided by the platform left much to be desired as far as how content was displayed. It was also difficult for the team to upload images, share content via social media and host contests. At this point, the team needed a new image gallery platform and began looking for a third-party solution. The team vetted possible solutions to integrate a new photo gallery platform on the site. The creative team was onboard with one solution after seeing a demonstration of the product, particularly in how a gallery could mimic the look and feel of the website. Another aspect the team was looking for was the ability to host the galleries directly on the site instead of sending viewers to a third-party site. Finally, the team wanted a solution that would provide easy sharing of images and tie into hashtags on social media for Mizzou fans to be able to share their images with the association easily. The Mizzou Alumni Association's coordinator of engagement worked with the solution provider as well as the Web platform to get the image galleries up and running. Roloff worked with the teams involved to ensure that the image galleries would mimic the look and feel of the overall alumni association website. To start filling up the pages with images right from the get-go, Roloff and the team brought in a number of images from prior photo galleries to begin filling up the space of the site. In addition, Roloff now had the ability to set up hashtags for image galleries, in which the gallery will pull in content from social media sites to populate the image galleries on the alumni association site. 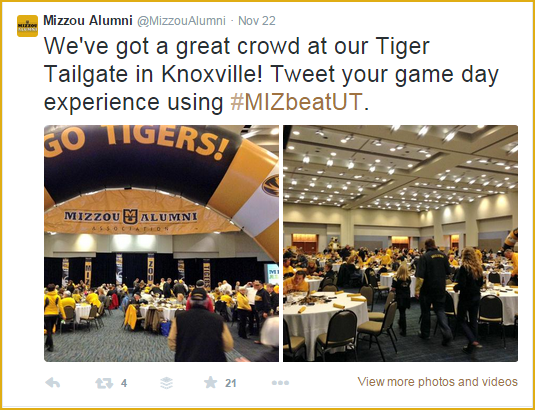 Once the team began building galleries with the gallery platform, they began leveraging Mizzou's social media communities to funnel in more images into the site's galleries. One such way the alumni association has been able to build up user-generated content is through contests. The Mizzou Alumni Association hosted a Halloween costume contest that drove the community to submit photos and allowed for visitors to cast votes and share their favorites. 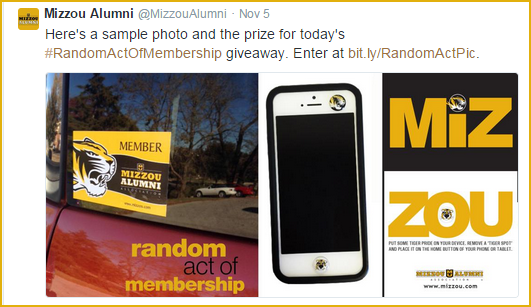 The contest ran in the fall of 2014, and the winner received $100 to the Mizzou University store. An older gallery brought over from the previous site, Mizzou Mutts, was also launched as the new image gallery setup allowed for easier uploading of images by users. The Mizzou Mutts gallery is open for users to manually upload an image or use the hashtag #MizzouMutts on Twitter and Instagram to submit their image of alum-owned pets. To generate entries to fill up image galleries on the website, the marketing team reached out to the Mizzou Alumni Association's communities on social media, specifically Twitter, Facebook and Instagram to announce new contests. The Mizzou Alumni Association is always on the lookout for new contest ideas to connect with the alumni community. 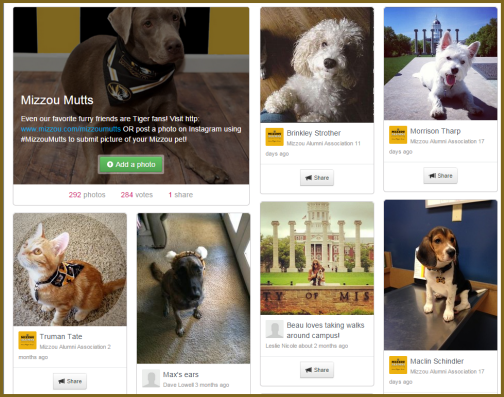 In the past, the Mizzou Mutts gallery was implemented with the site's previous website platform's capabilities, but the internal team had to manually upload submissions and they didn’t live in a gallery. Because of the flood of submissions coming in, the team knew they had touched a heartstring in the alumni and carried over the idea into the new image gallery platform, which allowed user-generated content to be posted. For new contest ideas, Roloff explained the team brainstorms ways that alumni are connected to the university through something they do in their everyday lives. "The power of photos is just so effective to get people to really stop, come back to the site and want to see more and thumb through the galleries," Roloff said. The team leverages holidays, such as the Halloween image contest and Christmas contests, to generate user content. In addition, a new gallery the team is looking to launch will be Tiger Tots, which will focus on babies wearing Mizzou gear. "Our Mizzou Mutts and Mizzou-Boo Halloween costume contests are two good examples that might not bring in the million-dollar donors, but they're great touch points in the lives of average alumni," he added. The Alumni Associations main social media accounts are Twitter and Facebook, with 17,000 and 22,000 followers and likes, respectively. The association also has a LinkedIn following of 113,000 but is still considering ways to promote the community image galleries on that network. For Facebook and Twitter, the marketing team will invite submissions to galleries and post sample submissions to help the community get ideas of what to submit for a particular contest or gallery. The marketing team also engages the online community through posting major announcements, sporting news and day-to-day alumni updates and shout outs to award winners. They will also repost some of the favorite image submissions they receive to promote the user-generated content. "The user-submitted photos are just perfect for us. When people submit them and we see a great photo, we'll make sure to feature that on our social media, and whenever we do post a great photo or photos on any of our social media, that always gives a little bit of a surge of additional entries into the gallery," Roloff said. With the image gallery platform, the galleries can be populated through hashtags that users tag their images with on social media. One example is #Mizzou, in which images are pulled into a gallery called "Mizzou From You." The gallery currently has most than 6,000 entries from the community with moments spanning campus shots, sporting events, selfies in Mizzou gear and much more. In planning for future galleries, the team establishes a hashtag for each spirit rally and pulls in images from those campaigns to save for later uses. With any user-generated content effort, images manually submitted or tagged with a hashtag are monitored and approved by the marketing team. When new images come into the image galleries, the marketing team approves each one for content before it appears online. While inappropriate content is rare for the Mizzou Alumni Association, heated sports rivalries can spur content that is not in good spirits, according to Roloff. The overall alumni association consists of a staff of 30, with four on the marketing and strategic communications team. Of those four, they can police content and help with the look and feel of the site. There are two main team members who go into the image gallery platform on a daily basis and monitor content and make sure everything is running. In the future, the marketing team has an initiative to reach out to users who submit their images to The Mizzou Alumni Association and touch base with them to get them more engaged with the alumni community. "I think it opens up a whole new level, maybe a very base level of alumni engagement and just lets us communicate with people or connect with people in ways that we never dreamed possible four or five years ago," Roloff explained. In communicating the success of the image galleries, the association shares with the university through updates on number of images coming in and how many galleries were built over a time period. "Today is definitely a digital world, and photos are an extremely powerful medium, especially when they're authenticated by being user-submitted and not posted by a university for PR purposes," Roloff explained. Since implementing the new image gallery platform on the Mizzou Alumni Association site, the marketing team as achieved a 15% increase in traffic and more than 30,000 unique visitors in just over a year. In addition, more than 6,000 people (and counting) have submitted images to the site's galleries. Roloff attributes the success of simply adding user-generated contest to the fact that these pieces of content carry more weight simply by being submitted from the community. "We never had this kind of glimpse into our members’ lives as we do now when they've submitted so many different user-submitted photos," he added. Connecting the alumni community to their peers via a common experience enhances the pride of place our alumni has and helps the alumni association engage the base and makes them closer to supporting the university. As a result of a more grassroots strategy, Roloff explained that the numbers of small donations has been increasing from the everyday alumni. "I think that these kind of services add to the feeling of, 'Oh, that $5 isn't too much, $10 isn't too much; I can donate to this or that.' And I think it's just helping overall the connection they have to Mizzou and the willingness to support Mizzou that they might not have had before," Roloff explained. As for future efforts for the Mizzou Alumni Association, the team is looking to incorporate the ability for users to post videos to the galleries as well.